Linocut print and gold leaf 23.75ct on paper, hand-assembled. 78x78 cm framed. The Arabic word iltibâs, from the Semitic root l-b-s, “to clothe”, means “revetment”, but takes on the further meaning of “ambiguity”. 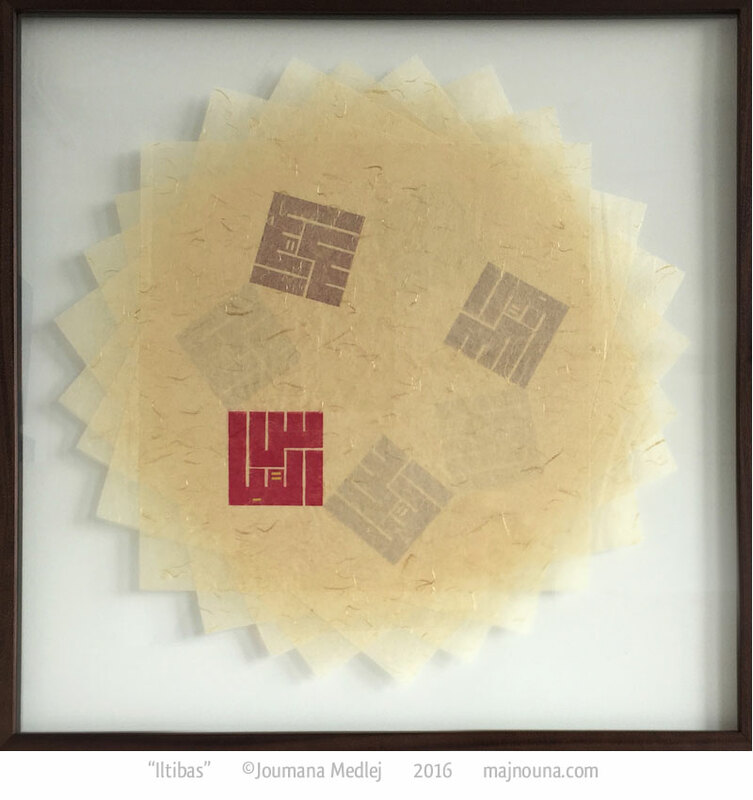 I used layers of Japanese paper stamped with the design: they are 7 in number, to symbolize the 70,000, and assembled so as to form a 7-sided geometric figure. Due to the layering, not all parts of the figure are equally visible, so that the pattern seems incomplete at first glance. However, if you go beyond the first impression and look closer, you can just make out that there is an unified underlying pattern, even though the only way for it to be revealed in its fullness would be for a light to shine for you from the other side. Printing with a hand-carved lino stamp. Gilding the dots on the top layer.